This page of the our story is dedicated to those milestones that have contributed to the club's development since it was established in 1925. There is no doubt that as the club continues to grow more great milestones will be added. From sandscrapes to grass greens. In terms of a milestone in the club's development, the move to establish grass greens on the course was probably the biggest of them all! 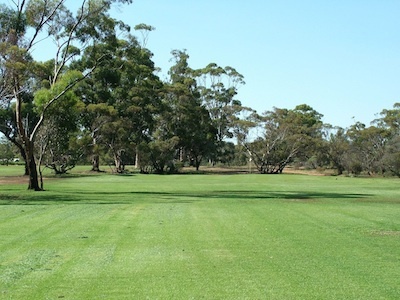 Grass greens converted Red Cliffs Golf Club from the 'poor cousin' of Sunraysia golf into a club on equal footing with others in the district. The process to establish grass greens on the course was a long and detailed one and as such requires considerable coverage in the club's story. 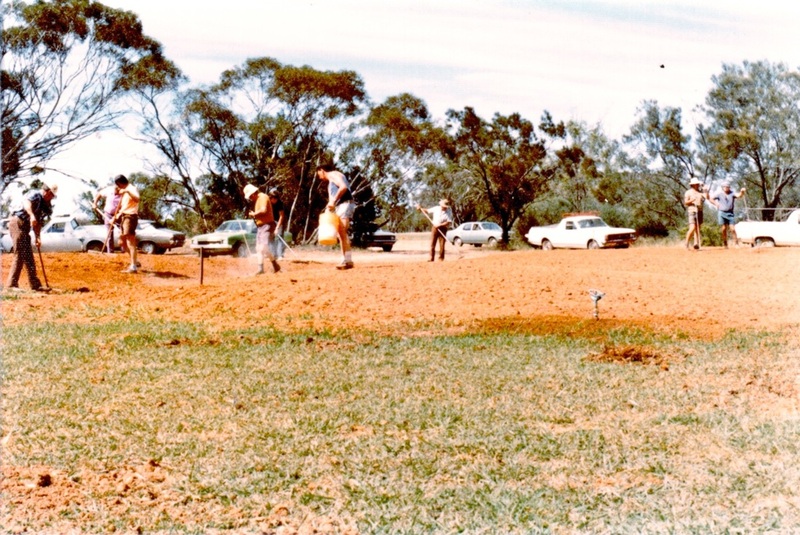 Top: Seeding the 4th green in 1976. Bottom: The 4th green in 2010. This great club milestone was carried out by members volunteering their time to continue the development of their club. What a magnificent achievement! In the early 2000's the club was struggling to keep going and something had to be done to improve the financial situation. A sub-committee was formed to investigate what options were available to the club and after several months of deliberation and discussion the decision was taken to establish a lawn turf enterprise. The club's Course Superintendent at the time, Tom Crawford, argued that a lawn turf farm was a perfect fit for the club because, after all - what do we do; we grow grass. In early 2004 a start was made to establish the turf farm and the rest is history. Tom Crawford, Andrew Wood & Mick Hogan inspecting the growing lawn turf.